Dolphins are so smart, fun-loving and entertaining to look at that it is no wonder so many people choose them as their favorite animal. 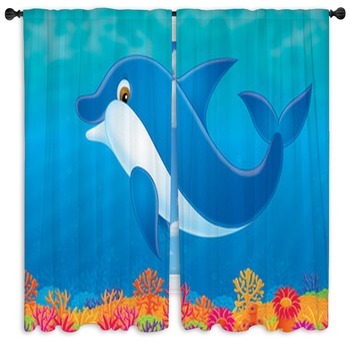 Whether you opt for a cartoon version or a photograph, dolphin window curtains are the perfect addition to any aquatic bedroom. No matter what, they make the atmosphere a bit more fun and carefree, as they always seem to be showing off their moves and having a good time in the water. 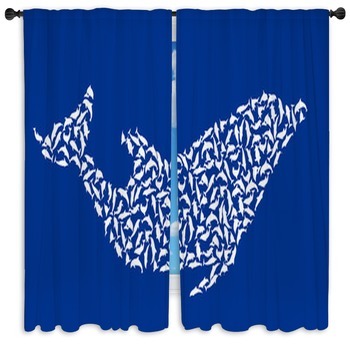 One amazing design for dolphin window curtains depicts not one, but two dolphins diving out of the water. One higher than the other, they are soaring across the sky and making a splash while doing so. 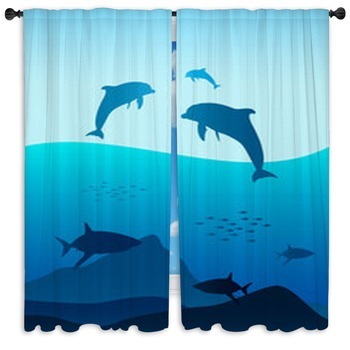 With the blue sky as the background, the ocean below and some rocks to meet the water, this is a great addition to a beach-themed room or one that is centered on the animals themselves -- it is an amazing sight! 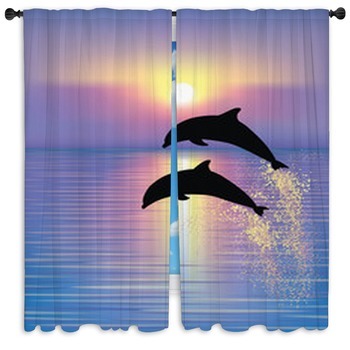 Another option for dolphin curtains, which also incorporates multiple dolphins, is one with two of them diving back into the water. 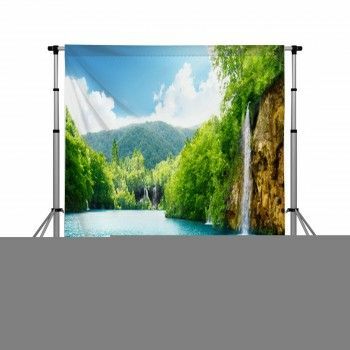 This is great for an aquatic room, as the water they are swimming in is extremely clear. Its blues and greens will surely accent the rest of the room. Additionally, the diving aquatic creatures will incorporate a bit of fun as you watch them approach the water on their downward dive, ready to make a splash! 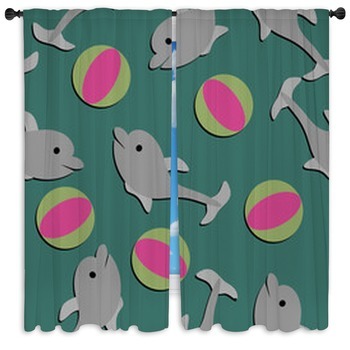 Dolphin window curtains are a great idea to put into the bedroom of a child, as well. 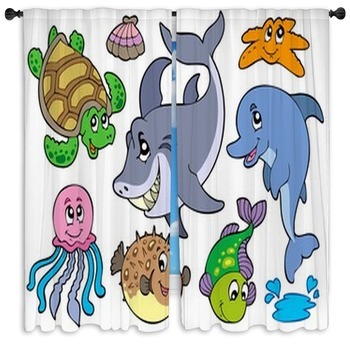 Good window curtain ideas incorporate not just this creature, but also all his sea-life friends in their cartoon form. Kids will love seeing all the sea life as the creature hangs out with his friends the orange octopus, a red crab, a blue seahorse, a cute penguin, and many more! This way, many other types of sea life will fit right into the rest of the room. 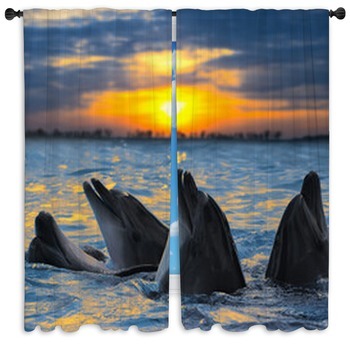 Another way to incorporate dolphin curtains into the home is to use them as bathroom window curtains. Some designs will fit more into a bathroom than a bedroom or any other room in the house. For example, one features a flat, blue design of the creature's shape in the form of a pattern. It is the foreground of the pattern, the background being several bubbles in other shades of blue. These add great color to the theme of the room and a slightly busy print to accentuate. 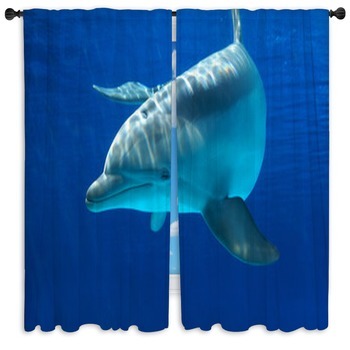 It is also possible to show off dolphin window curtains which are a bit more mystical in appearance. For example, have you ever seen a white, misty-looking dolphin diving straight up out of the water? This creature almost looks as though it is made out of clouds, and the image is mysterious and beautiful to view. 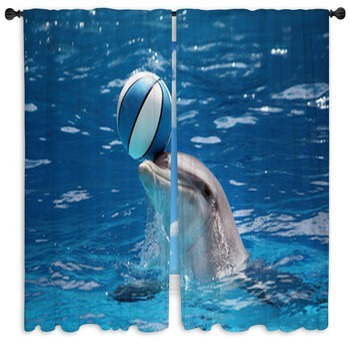 It is a great way to tie together an aquatic love with the interest of fantasy into a bathroom or bedroom. 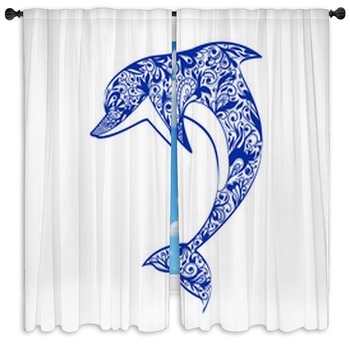 Dolphin decor is perfect for both bedrooms and bathrooms for occupants of any age. These little guys can be portrayed in photographs, as cartoon characters, or even as visitors from a more mystical realm in the room of your choice. 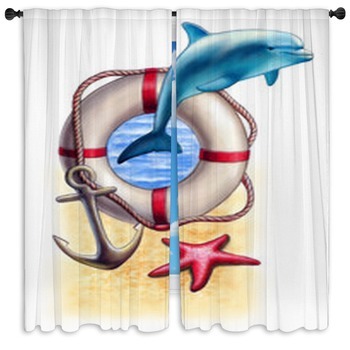 They are a must-have finishing touch for any aquatic or beach-themed room, incorporating fun designs and lots of color into the window area of your home.